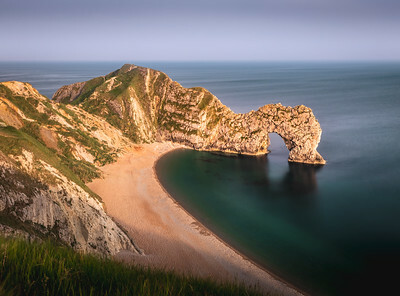 After shooting Durdle Door from the top of the cliff at sunset with a less than ideal sky, we headed down to the beach in hopes of some dusk colour and we were rewarded with this stupendous view. Just cannot wait for spring. Long and warm days, beautiful wild flowers, glorious sunsets on gorgeous beaches and being able to trek without freezing to death. Until then here is a throw back to last spring when we visited the beautiful Isle of Portland on the Jurassic coast. This was our first shoot of the trip and I couldn't have asked for a better start to the trip. Last one of the Durdle Door I promise, at least for a while. I recently found out that it is privately owned by the Welds, a family who owns 12,000 acres in Dorset in the name of the Lulworth Estate. 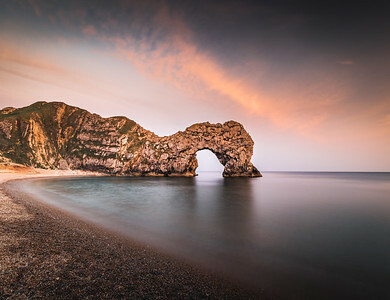 Wow, to actually own something as awesome as Durdle Door - amazing. Anyways, we were almost done shooting here and decided to leave for the day when the wind blew this group of clouds behind the door and they perfectly aligned in the frame while catching the last light from the setting sun. Had to get one last shot. 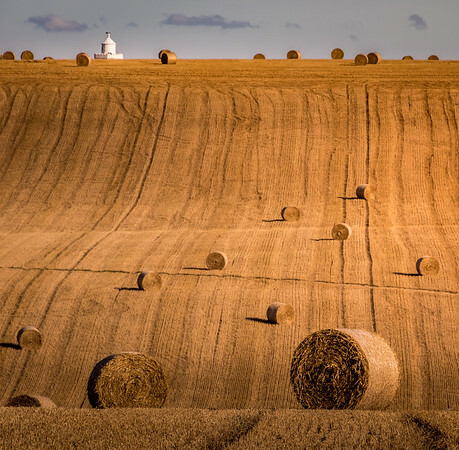 A random shot on the way to Seven Sisters on the south coast of England. Got this shot courtesy of BMW's navigation system when it decided that we needed to be more adventurous and routed us through an unmarked country road. It did take us longer but we got to drive along such views. I am not complaining. 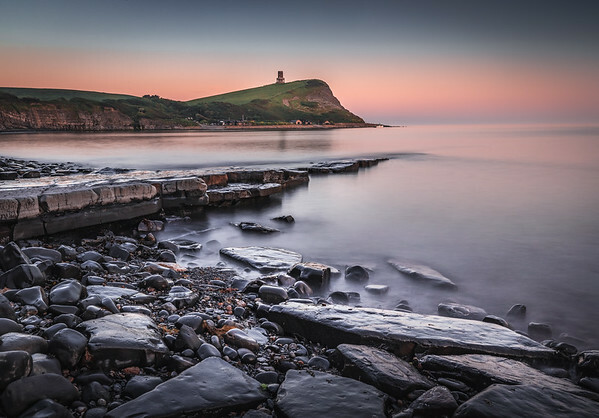 We reached Kimmeridge bay a little too late for sunset as we did not take into account the extra time needed to navigate the winding narrow roads. Just as we parked and started walking towards the bay, the moon rose while the sky was still lit up with glorious twilight creating a combination of orange and blue hues in the sky. Absolutely magical golden hour, we were not disappointed. We had finished shooting at Old Harry Rocks and were about to head to Kimmeridge when this gorgeous sail boat emerged from behind the rocks. Luckily I still had the drone up in the air and just enough juice left in the battery for this shot. 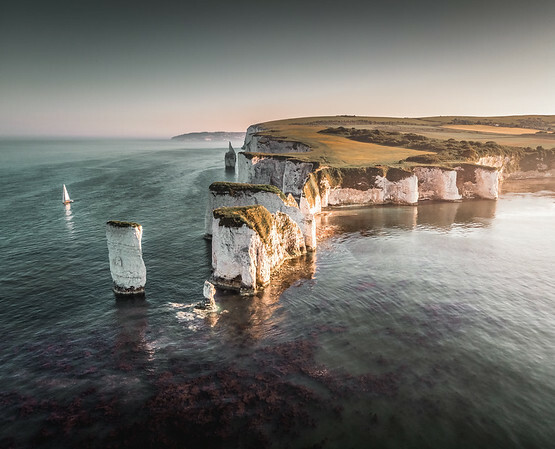 It was just a matter of positioning the drone so that I could get the warm light from the setting sun reflecting off the white cliffs and the boat. Inspired by a picture taken by @nomadlad. @eyeseesurs was refusing to climb the rock in a dress until I showed her the picture taken by Tom which motivated her to climb the rock for this shot. 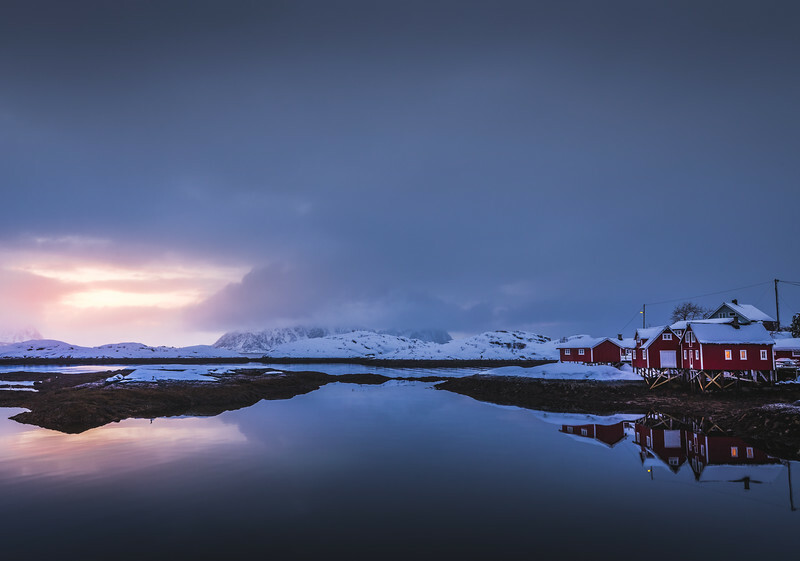 The sky was almost overcast but some colour appeared in the sky just before sunset. How may canoers can you spot? There are a lot of stories about the naming these rocks. 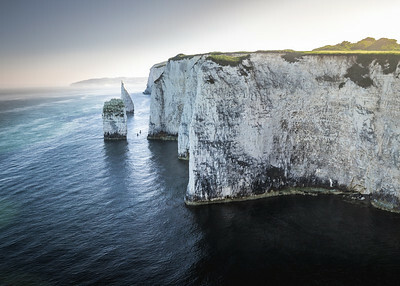 A legend says that the Devil (traditionally known "Old Harry") slept on the rocks. 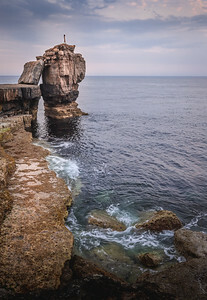 Another one says that the rocks were named after Harry Paye, the infamous Poole pirate, who hid his ship behind the rocks awaiting passing merchant vessels. There's also a story about a ninth-century Viking raid was thwarted by a storm and the drowned Earl Harold was turned into a pillar of chalk. 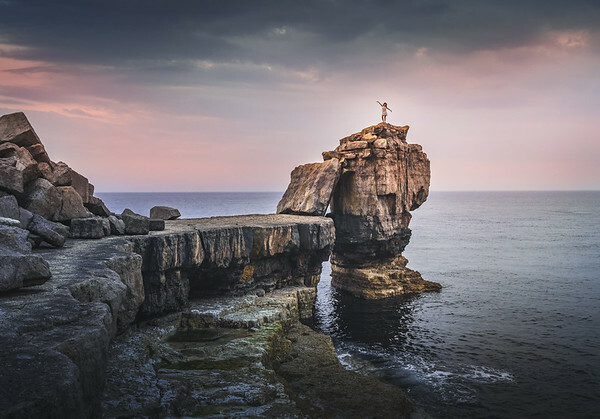 The large outcrop of rock at the end of the cliffs is called as "No Man's Land". Following your dreams means getting your feet wet! A sundowner from Durdle Door. Thanks @eyeseesurs for stepping into the cold water to pose for this shot. 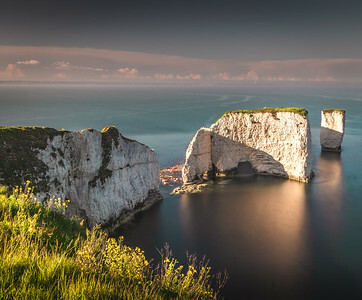 Old Harry Rocks drenched in the evening sunlight just before sunset. Can you spot the Canoe? I like how the cliffs are casting their shadow on parts of Old Harry as the sun sets behind them. 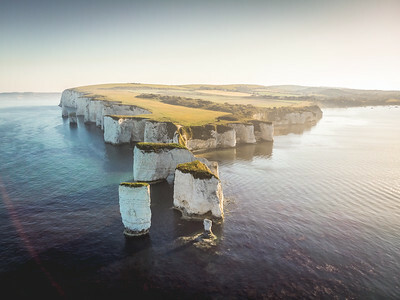 The classic drone shot of Old harry rocks just before sunset. Its always good to find new and unique perspectives when you visit such a highly photographed place. But you got to get the classic in the bag first. 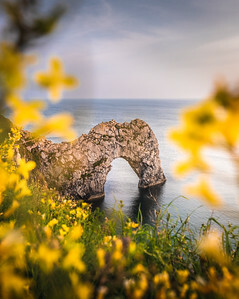 In anticipation of spring, one from last year shot at Durdle Door with wild flowers in full bloom and the evening sun casting its glow on the flowers and Durdle Door. You gotta love spring in the UK. 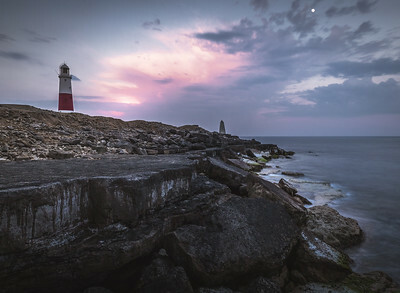 After shooting at the Pulpit rock at sunset, we did not realise that the moon had risen well over the horizon and there were still sunset colours in the sky. This is what I like about summers, you can keep shooting for hours while the light changes. In winters this scene would be over by the time I moved my tripod to setup for this picture. While waking back towards Lulworth Cove after shooting sunset at Durdle Door, we saw this mansion on the top of a small hill right next to the ocean and couldn't help but wonder how amazing it would be to live there, right in the heart of Jurassic coast with the cove on one side, Durdle door on the other and the vast ocean in the front. 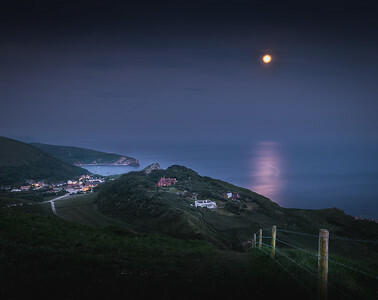 And to top it, few clouds that were in the sky also parted, to reveal the full moon reflecting bright on the night ocean and created this mystical scene. 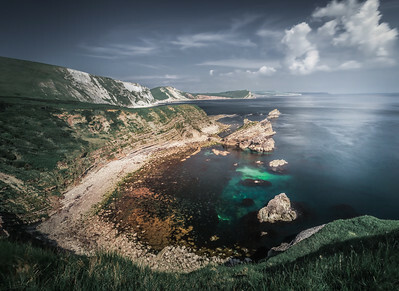 An un-traditional shot from the Jurassic coast. 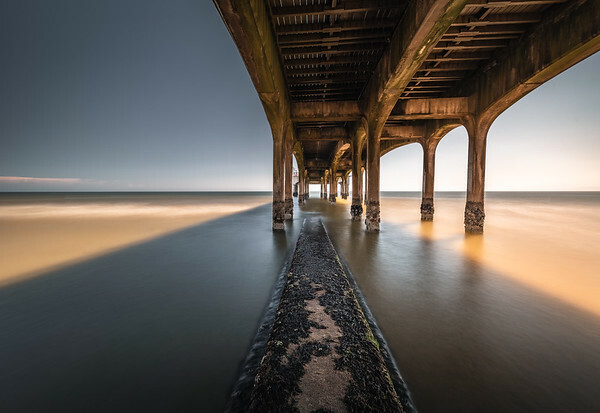 Boscombe Pier is one of the most famous tourist attractions in Bournemouth. It was opened on 29 July 1889 by the Duke of Argyll but was partially demolished during World War II to combat the threat of invasion. It remained derelict for a number of years and was fully reopened in 1962. In 2014, a musical walkway was added to the pier, featuring 88 custom-made chimes that play ‘I Do Like To be Beside the Seaside’ when struck in the correct order. The beautiful pastel shades of twilight. This was shot around 10 PM on a beautiful spring evening. The one thing I love most about English spring/summer is how the last light just lingers in the sky for hours giving you plenty of time to get these sparsely lit shots of the blue hour. If you are lucky enough to be shooting at the coast with the horizon to the west, you can shoot for hours after the sun has gone down. After trekking almost half a mile on a pebble beach (torture for the feet and knees) and then climbing the edge of the cove on an unmarked trail, we came to this spot overlooking Lulworth Cove. First glance at this view and we instantly forgot the sweat and pain endured to reach here. Well worth it! 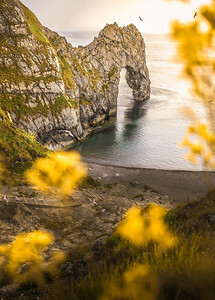 Spring was in full bloom when we visited Durdle Door. Could not resist using these bright yellow wild flowers as a frame. 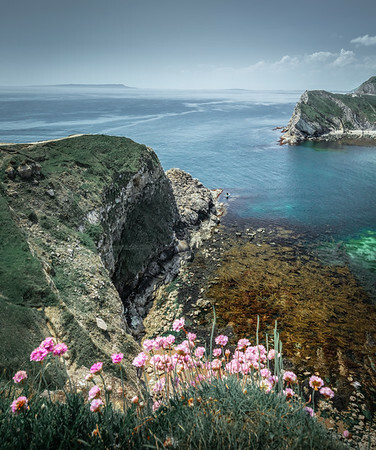 This is no doubt one of the most beautiful coastline in the world. Cant wait to go back. 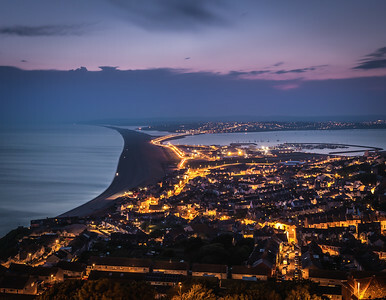 After shooting at the Pulpit rock and Portland Bill, we were on our way back to Weymouth when we drove along this hill top which offered fantastic views of the Isle of Portland. Isn't it amazing when you come across such unexpected and brilliant views just along the road? Mupe bay has long been a military weapons testing site. The Jagged coast line you see here was created by erosion from the sea and by years of high explosive and missile testing which gave this area a unique and dramatic coast line. 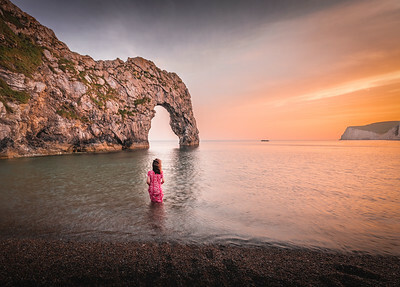 After walking about 6 miles along one of the most scenic coastlines I have seen, we reached Durdle Door in time for sunset. 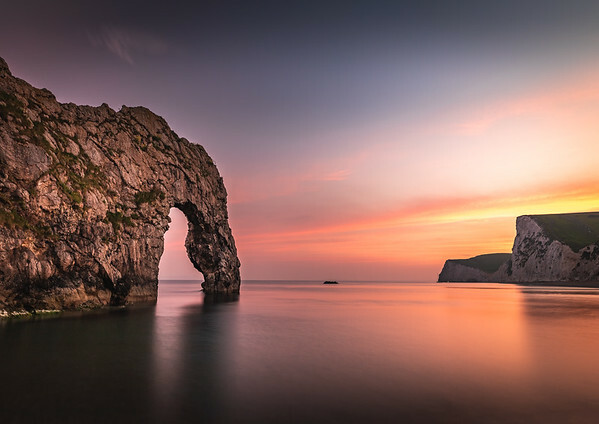 As the sun set behind the cliffs, it cast its last light directly on Durdle door making it glow. There were no clouds in the sky at the time, at least not behind the door so we did not get a dramatic sky. But after the sunset, the sky changed completely, but more on that later with some sweet pics. 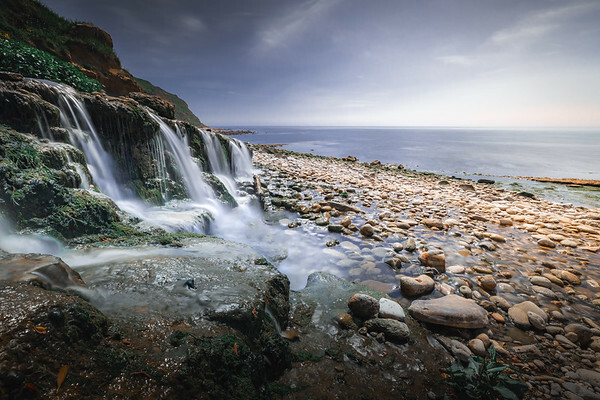 The small waterfall at the mouth of Osmington bay. Osmington Mills is a coastal hamlet in the English county of Dorset. Famous painter, John Constable, spent his honeymoon at Osmington, and finished many paintings here. Smugglers Inn built in the 13th century is located next to the sea here and was one of the main landing places for smuggled goods in the 17th century. 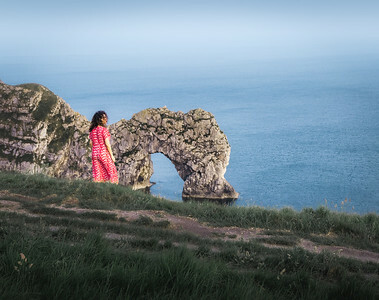 @eyeseesurs staring into the hazy ocean at Durdle Door while adding contrast and colour to the scene. 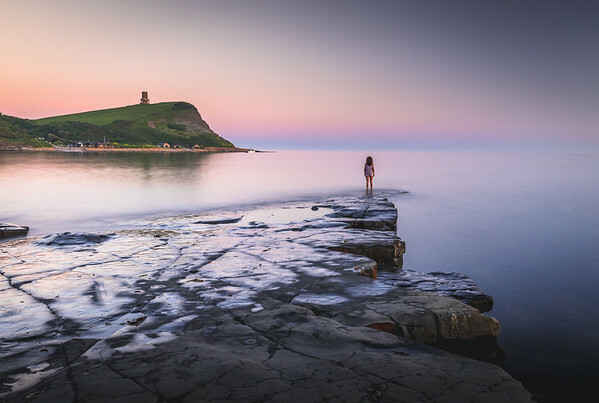 This is one of the most visited and photographed place in the UK which makes it extremely difficult to get a unique perspective. This is my attempt to create something different. 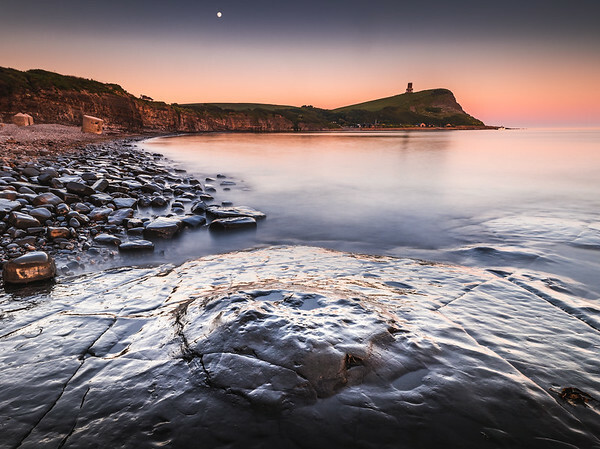 After shooting sunset at the Old Harry Rocks, we planned to be at the Kimmeridge bay during twilight. Easier said than done because we had to walk back to the car park (at least a 20 minutes walk) and then drive to Kimmeridge (at least a 30 minutes drive). I am sure I broke the speed limit more than a few times on that drive but we managed it.